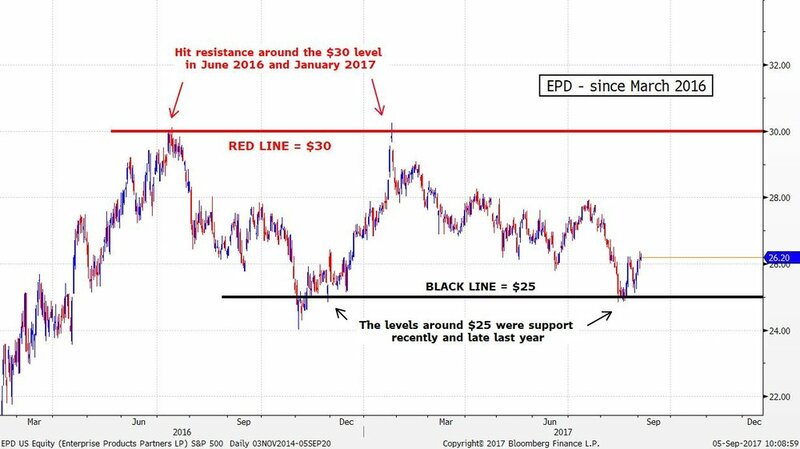 Enterprise Products Partners - EPD recently found support around the $25 level and is now consolidating just above it. There was support there because it was the lows at the end of last year. If it rallies, there will probably be resistance around the $30 level. There was resistance there in June of 2016 and January. 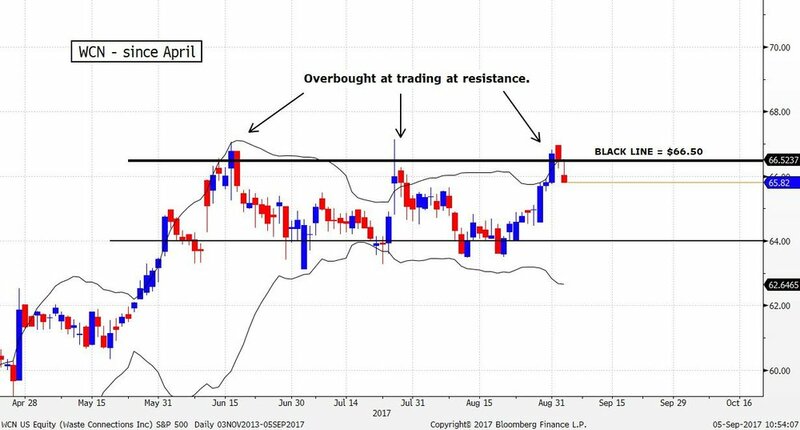 Waste Connection Inc. - WCN is overbought and trading at a level that has been resistance in the past. In June and July, it became overbought and hit resistance around the $66.50 level as well. It will probably consolidate or head lower in the short-term. Schlumberger LTD - SLB is still in the downtrend that began early this year, despite the move upwards today. A possible trading strategy would be to buy it once the downtrend line is broken. There is nothing mysterious about trendlines. When something is in a downtrend it means that the forces of supply are in control of the market. When the trendline is broken, it means that the forces of demand have taken control, or at least have become equalized with the supply forces. Longer-term, if it trades down to the levels around $60, there will probably be support there. These levels were support in the middle of 2012 and again in early 2016. They would be good levels to buy it at if you are Bullish on the long-term fundamentals of the company. Axalta Coating Systems - AXTA closed at $29.13 today. It gapped down through the important $30 level in early August due to a missed earnings report. The $30 level will now probably be meaningful resistance because it was an important supply level in October and November of 2015, April and May of 2016, and again in February and March. If you are Bearish on the fundamentals of this company, this is probably a good time to sell it. 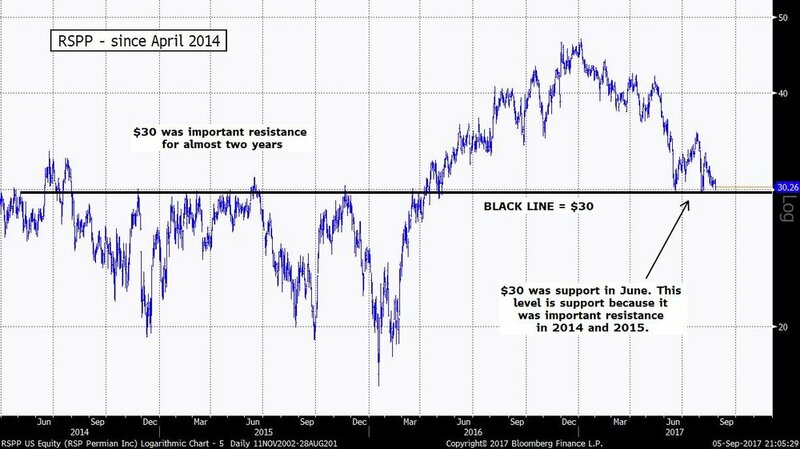 RSP Permian Inc.. - RSPP is back down to trading and testing support around the $30 level once again. These are very similar to the dynamics I discussed in the July 24th report. It isn’t surprising that there was support at this level because it was clearly defined resistance in 2014 and 2015, and again in March of 2016 before it was finally broken to the upside. If you are Bullish on the fundamentals of the company, this would be a good time to buy it.